Scott Greer at the Daily Caller warns that “Pro-amnesty hawks are in for a rude surprise.” His analysis is questionable on several points. 1. No Republican supports amnesty. Which specific GOP-backed proposal, by a magic snap of the fingers, automatically grants illegal immigrants legal status without paying penalties? 2. Greer’s all-or-nothing vision is false. He predicts immigration reform will create “millions of new Democrats overnight,” but what specific legislative provision is he referring to? Republican-backed reforms typically mean that undocumented immigrants have to pay a fine and wait for several years before getting in back of the line just to apply for citizenship. And mere legal status is no ringing victory for Democrats. Meanwhile, he thinks Republicans like Bret Stephens naively anticipate a tidal wave of minority voter support if only they could pass immigration reform. I can’t see behind The Wall Street Journal’s paywall, but I’ve not heard or read anything to that effect from Stephens or others. The depiction is a straw man to boot. 3. There is no moderate wing of the Republican party. Greer pegs certain Republicans as “self-proclaimed moderates” without explicitly stating who does so. Neither do we know what they are moderate about: rhetorical tone or policy substance? In terms of tone, self-restraint, patience and foresight are marks of being a grown up. Bombastic rhetoric puts you on the loser’s path in the general election. Americans go for the happy warrior instead. In terms of policy substance, conservatism is a matter of principle, not what tribe one belongs to. Besides, isn’t identity politics what Democrats do? And no, “neocon” is not a tribe. Interestingly, Greer has made no case whatsoever as to which of the purported wings of the GOP is more conservative. 4. Greer offers no practical alternative. Assuming that demographic doom is written in the stars (and it isn’t), what is the real path to GOP electoral victory? Refusing to grant illegal immigrants any legal status whatsoever will turn off more independents than win them; they will see such a candidate, as Ted Cruz is shaping up to be, as callously bull-headed, not a hero with backbone. As Michael Medved astutely asks, what would Trump or Cruz’s plan be to win swing states like Ohio, Florida, and Virginia? There is no hidden army of conservatives that stayed home in 2012. Rhetorical bombast won’t materialize that army. The progressive media will only use it to turn crucial independents away from the GOP. 5. Conservatives inhabit reality, not fantasy. Trump has promised to build a big beautiful wall and get Mexico to pay for it. He’s insisted that all illegals will have to leave America and touchback in their home country. Even those who have been economically and socially integrated for more than a decade. This is fantasy talk, and fantasy is the province of the deluded and of dreamers. That’s the base of the Democratic party, not the GOP. Politics is the art of the possible, not the bottom line of an anger retail industry. The Oatmeal, a fairly popular web comic, put out this recent analogy about philosophy, religion, and science. Here are some things to note. 1. The anaology doesn’t explain anything. As with many expressions of humor or wit, The Oatmeal’s message is implicit. In the middle of the twentieth century, philosophers of science and language undertook the projects of logical positivism and verificationism to try to make sense of non-empirical statements. If we take The Oatmeal’s comic under this rubric, at best we might interpret it as emotive. The Oatmeal seems to be saying, “Yeah, science, that thing. I love it! It gives me that feeling like when you find something you’ve been looking for. And those other things, boo on them.” That’s a quaint sentiment. 2. Science is a branch of philosophy. What we today call science is both a certain practical way of knowing and a body of knowledge. During the later stages of the Enlightenment, what was called “natural philosophy” became known as natural science, and then later, just science. However, philsophy, metaphysics, and theology have at various times claimed and often do exhibit what we’d call “scientific” rigor. Science is not owned by physicalists, materialists, or fanboys of scientism. 3. The flashlight doesn’t shine on itself. Empiricists commit themselves to sense data to understand the world. Of course, they can’t just use sense data. They rely on many presuppositions that aren’t empirically justified. For example, mathematical truths, the constancy of the laws of nature, the truth that the world exists for more than five minutes at a time, etc. The very tools that let you know what function a flashlight has, have confidence that it is good at what it does, and tell you what to do with the cat once you’ve found it, are sciences like philosophy, metaphysics, and theology. 4. Being in dark rooms with cats isn’t like our everyday, ordinary experience. Nonetheless, philosophers often use the analogy of a room to achieve greater understanding the world. Consider Serle’s Chinese Room thought experiment. More recently, cold case homicide detective and Christian Apologist J. Warner Wallace has used such an analogy in his book, God’s Crime Scene. He lays out a case as to how there is a divine intervener outside the room of our universe. 1. 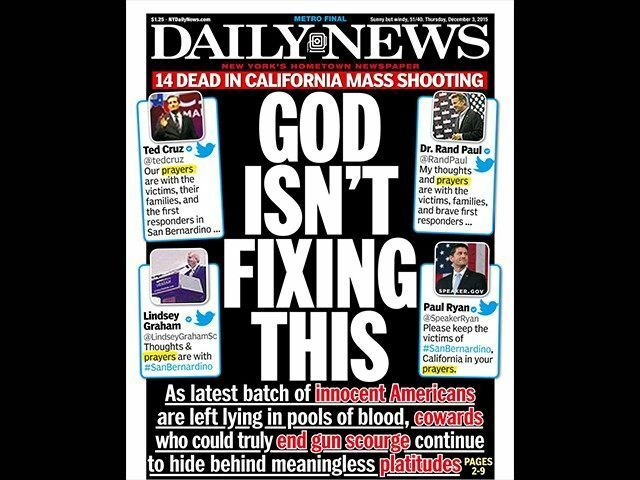 The editor isn’t omniscient, and ignores God’s revelation that he is at work in the world, whether we pray or not. 2. Prayer has multiple purposes, and it is somewhat known amongst people who pray that God is not a cosmic vending machine. 3. “My thoughts are with you” doesn’t fix the problem any better than prayer. 4. Hillary Clinton’s politically expedient call for more gun control “isn’t fixing this” either. 5. This headline is is a product of the “do something disease” and the mistaken notion that government just needs to push a big red button to make it stop. Rather than emote or stoke vitriol against disfavored GOP candidates, this newspaper editor needs to grow up. Black Lives Matter, and they hold to quantum indeterminacy? Let’s applaud Democratic pundit David Mercer for appearing in a debate about Black Lives Matter on Fox News’ “Strategy Room.” Yes, I was watching Fox News, but I am hopeful that Pope Francis will soon be offering absolution for that particular sin. Seriously though, it’s praiseworthy whenever people with different views come together for discussion. Even if it’s stuffed with rote partisan talking points and there’s more heat than light. When black men–now I’m above the age–but I had a better chance between 18 and 35 of going to jail or being shot than I did getting a college education. Percentages apply rightfully to the activity of indeterminate theoretical entities, like the chance a subatomic particle will pop into being out of a quantum vacuum. Individual human beings, who are always particular and situated in history, don’t reduce down to a neat statistic. They always have the messy baggage of having had some particular woman as a mother, man as a father, or another person as guardian who raised them for better or worse. There are always certain values instilled, and a particular cultural milieu present. Whatever the mix of people and experiences, I bet it was this, more than mere statistical chance, that determined whether Mr. Mercer ended up going to college. None of this is to “blame the victim” for those who end up killed or in jail. By the way, are there some excluded options, like going to trade school or just entering the workforce? At any rate, the claim I’m making is modest: persons are particular, and given the knowledge a person has about himself, any claim he makes that some statistical chance holds sway over him isn’t credible. It is one thing to talk percentages about the weather or health events, but socioeconomics always involve people informed by values who are making choices. Whatever the issue may be–race, gender, jobs, or families–let’s not abstract away that part of the policy conversation. The New York Times reports today that “Undercover Planned Parenthood Videos Were Altered, Analysis Finds.” There’s almost no value to this story, because the only videos that the company chose to “analyze” were the shorter, edited videos, not the uncut, longer ones. To say an edited video was “altered” is trivial. It implies nothing about the truth of the content of the video. But, it said, “the manipulation of the videos does mean they have no evidentiary value in a legal context and cannot be relied upon for any official inquiries” unless C.M.P. provides investigators with its original material, and that material is independently authenticated as unaltered. First, the analysts balk at giving substance to the claim that the videos were altered. Taking after Derrida, they are totally agnostic about what the video is really trying to say, and how that might differ from what the raw data of the uncut video really says. Second, I’m not so sure that a “manipulated” video has zero evidentiary value in court. A testimony, whether written or recorded as audio or video, is necessarily a product of a human mind and hands at work. Call this manipulation. Yet, such testimony is often rightly admitted as evidence. More pertinent to Planned Parenthood’s legal troubles, the longer videos that the Center For Medical Progress recorded are very likely not “manipulated” in the nefarious sense that the analysts suggest. The job of a legal prosecutor will be to draw on that uncut video evidence to produce a case that in effect corroborates the shorter, edited videos. And it is the jury, not these analysts paid big bucks to say nothing of value, who will decide the matter. So what business does the New York Times have in producing this empty story, if not to carry water for Planned Parenthood? The report uncritically repeats the message of a company hired by Planned Parenthood. The coverage is one-sided; there’s zero effort to get comment by anyone not ultimately commissioned by Planned Parenthood. The headline is clearly meant to prop up the vacuous “videos were edited” excuse for ignoring the content of the CMP releases. Imagine how many social media feeds this unsubstantial NYT story is populating now, giving false relief to people who want to ignore the undeniable brutality, callousness, and illegality that these videos–edited or not–clearly attest to. Whatever The New York Times is doing here, it is not objective journalism. Donald Trump is leading the pack for the GOP presidential nomination, and many attribute his popularity to the raw anger out there in America. I’ve never been one for unconstructive anger. So let’s say you are angry, and you don’t just want to emote, but want our country to be doing better again. What’s the way forward? Here are four reasons why it’s not Trump. One recent poll reportedly puts Trump’s overall unfavorability at 59%, higher than even Hillary Clinton. What does it take to be even more unpopular than America’s robotic grandma, the secretive, defensive, and definitively Nixonian Mrs. Clinton? A recent swing state poll by Quinippiac showed not just that Hillary Clinton does worse than Joe Biden in head-to-head matchups, but that Trump consistently underperforms in those matchups compared to Jeb Bush and Marco Rubio. In Florida, Rubio and Bush comfortably beat Clinton and Biden in respective contests, while Trump eeks 2 percent past Clinton and falls to Biden by 3. In Ohio, Rubio and Bush best Clinton, but Trump trails her by 5, and goes down to Biden by 10. And in Pennsylvania, Rubio and Bush each beat the Dems while Trump loses to them. The pattern from this poll is clear: Rubio performs best overall, followed by Bush. Right now Trump doesn’t have what it takes to beat likely Democrat opponents. And given his stratospheric unfavorables, that is unlikely to change. There has been a “stupid myth” floating around since 2012 that three or four million conservatives stayed home rather than vote for patrician, RINO-squish Mitt Romney. Commentator Laura Ingraham has warned that conservative anger needs a chance to play itself out this cycle. According to common wisdom, Trump is the prime shot at that. Before we buy this premise, let’s go back and check the numbers. According to Michael Medved, Romney gained more than a million votes over McCain. When I crunched Wikipedia’s numbers, Romney’s gain was 985,177. And this gain happened amidst a decline of three million total voters between 2008 and 2012. If historical observations by Kim Strassel and Ed Morrissey are reliable, then the myth of disaffected conservative voters arose before all the votes had even been counted! As Churchill has been quoted, “A lie gets halfway around the world before the truth has a chance to gets its pants on.” The snarling, anti-establishment Right is not as powerful or predictably peeved as typically touted. Mr. Trump released policy statement last week that includes ending so-called birthright citizenship. This is an innovation in the debate on immigration, but it is a non-sequitur. Stopping illegal immigration has been, for conservatives at least, about a couple of more foundational principles: jobs for Americans and the rule of law. While I respect the drive to immigration reform that’s based on a concern for the rule of law, and the need to enforce laws, I don’t buy that ending birthright citizenship significantly increases job opportunity for American citizens. It is an arcane pursuit and any change to the job market will be indirect. So all of the energy for ending birthright citizenship must either come from a pure concern for the rule of law, or something more nefarious. Of course, many in the media and on the Left will gladly attribute xenophobia as the motivation. But if we give Trump the benefit of the doubt, his desire to end birthright citizenship must be about restoring some obvious mistake in interpreting the Constitution. He must be a candidate who champions the rule of law. The problem for Trump is that he has bragged about paying off politicians and he trades off of the force of his personal charisma. He does not inspire confidence that he will uphold the rule of law. Someone who supports both Trump and ending birthright citizenship owes an explanation as to their priorities: jobs or the rule of law? If the rule of law, then why Trump and not a more principled conservative? If jobs, then why so fervent about the arcane task of ending birthright citizenship? The third alternative is that the supporter is not a reasonable conservative, but a xenophobe or just an unreasonable voter. The latter, sadly for America today, almost seems par for the course. So, whether you are a Trump fan or suffer daily combat with a friend or relative who is one, I hope I’ve given you some food for thought. There are a lot of great candidates out there this cycle. Let’s be sure to elect one of them. You’ve probably heard this question asked before: “Who gave you the right?” In everyday situations, the accused might just take the question as rhetorical, or a mere expression of puzzlement or frustration. After all, he might be certain that his right is absolute or a brute fact. Then who are other people to question it? Yet, rights claims conflict and are doubted all the time. Is there a right to life or a right to choose? Is there a right to bear arms or the right to enjoy a gun-free zone? Supreme Court decisions aren’t even immune to controversy. To get a proper grasp on stubborn rights conflicts, we need to not just heed professional jurists, but reason along with ethicists and philosophers also. Modern rights theorists owe much to Enlightenment thinker Immanuel Kant. He pioneered a way of using “pure reason” to deduce what ethical duties a rational person has. In his Practical Critique of Reason, he asks, quaestio iuris, “by what right” should we make ethical deductions? A has a right to X against B by virtue of Y. This conception helps us see what substance lies behind a rights claim. Notice that regardless who is said to have the right (A), who must respect it (B, also known as the respondent), or what the right itself is (X), that the reason for it all is described by Y. This is the “justificatory basis” or the explanation of what ground the right. I’d suggest another way to justify a right, this one coming from the premodern scholastic Thomas Aquinas. In his commentary on Aristotle’s Politics, Aquinas wrote, “What gives reason for action is always some intelligible benefit.” He goes on to elaborate three basic common goods: religious fellowship, friendship, and marriage. While Aquinas did not explicitly address modern rights as common goods, it seems reasonable to me to do so. It is not a stretch to say that a right is a kind of reason for action existing for “some intelligible benefit.” The question becomes, what is the intelligible benefit of any given right? This is asking for a natural law basis of rights. In summary, I’ve given three approaches to rights. Kant focuses us on asking what duties impress themselves upon the rational person. Gewirth comes in a line of thinkers who break rights down into constituent parts. Finally, I’ve encouraged us to view rights as goods that serve a purpose. I’ve highlighted these aspects of rights in order to get people thinking about what rights claims really are. Another question we should address going forward is what makes rights binding? Back to Gewirth’s general formula, why does respondent B have a duty or obligation to respect person A’s enjoyment of right X?